This blog reports on activities that the European Commission is performing in order to contribute to the creation of a more attractive Europe for researchers and young people entering a scientific career, the final aim of which is to become a more knowledge-based society. The blog fosters the interchange of ideas and encourage academic conversations that contribute to a better understanding of the research and development policies in the European Union. The Figure above presents the research productivity and impact between EU15 and US in 1993-2002. It depicts the ratio of the publications and citations of the 15 European Union countries in EU15 to the United States on ISI databases in 1993–2002. (The EU15 total contains some duplication because of papers jointly authored between countries in the EU group. Counts for papers and citations are totals for country for the stated year.) 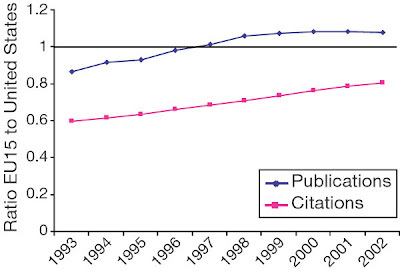 Figure shows that the gap in the total number of publications and citations has shrunk significantly in that period. By 2002 the EU15 countries were publishing more papers than the United States and were not far behind on citations. There are many potential flaws and concerns with this type of bibliometric analysis, such as the skewed impact of individual papers, the impact of self-citations , the aggregate of citations across disciplines and more. That explains why is difficult to find such analysis nowadays, but I think it worth posting since it provides the "Big Picture" or the forest in the "can't see the forest for the trees" expression. And if you believe that "the devil is in the details" I suggest reading the original article dated back in 2004!